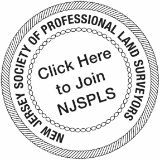 Welcome to The Online Community of NJSPLS! 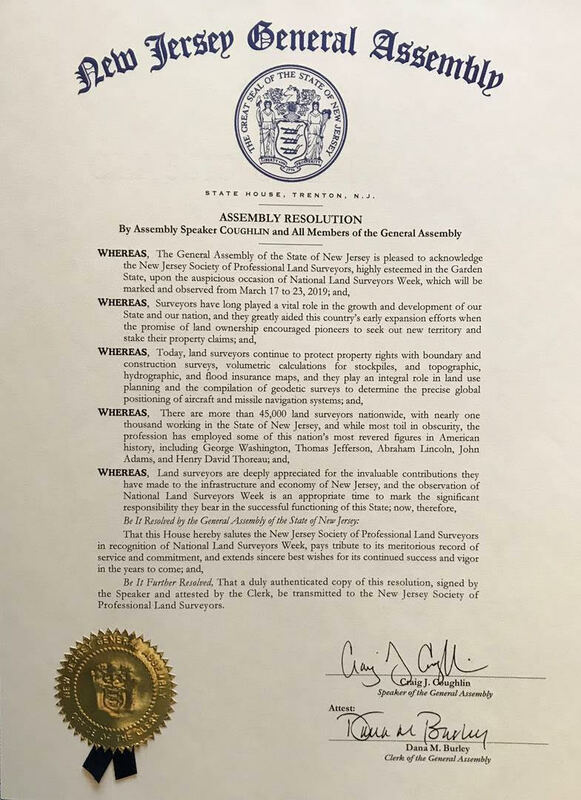 Our goal is to promote and enhance the profession of land surveying, assist surveying professionals through education and information, and to provide a unified voice for fellow surveyors in New Jersey. With the introduction of our updated website, our members will now have a wealth of resources at their fingertips (networking, Career Center, links, etc. 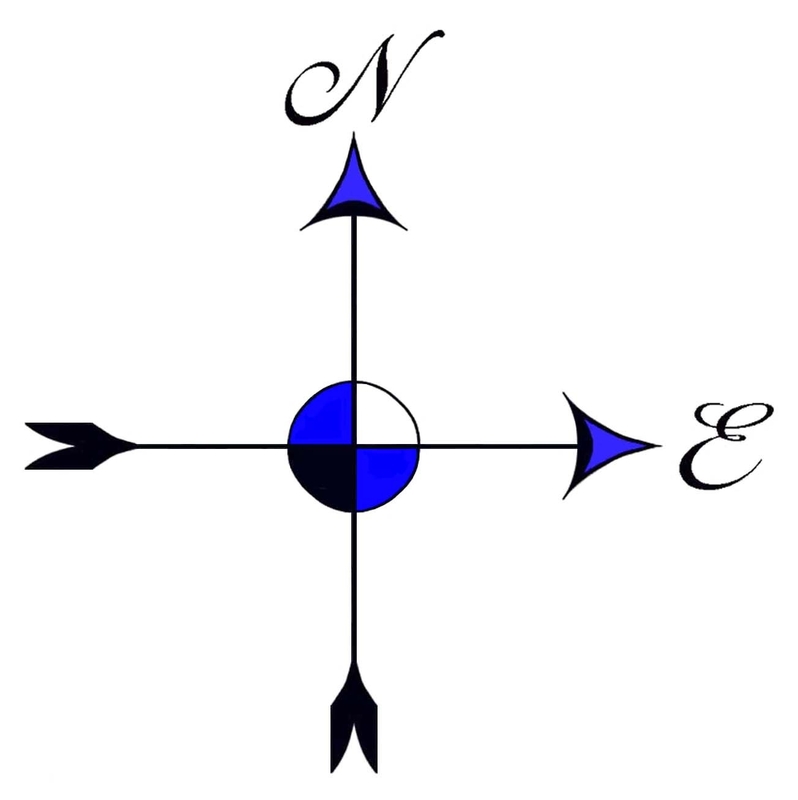 ), and where the public can easily search for a land surveyor. If you have a suggestion for something you would like to see on the site, your feedback is always welcome. Please click here to send your comments. Not a member? 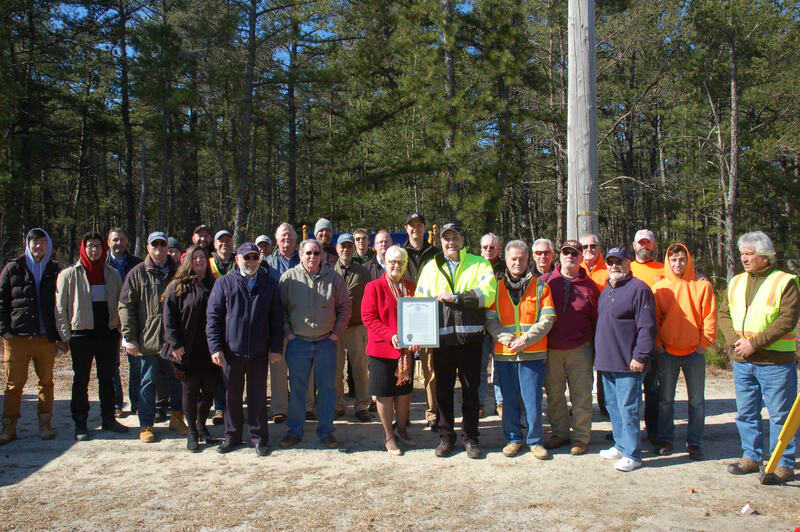 click on the "Join NJSPLS"
Approximately sixty people came out to commemorate National Surveyors Week at the Lacey Road Baseline Calibration site. 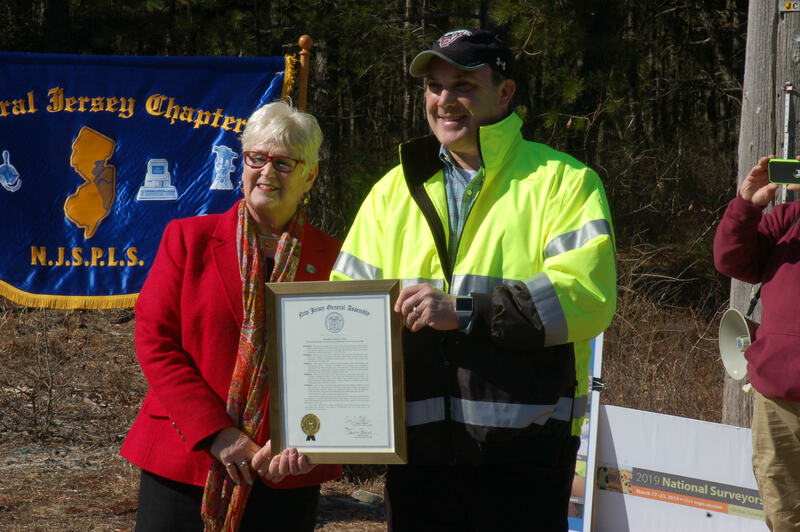 Assemblywoman Dianne Gove presented a proclamation from the New Jersey Assembly. The group was pleased to meet her and impressed that she took time out of her schedule to participate in the program. 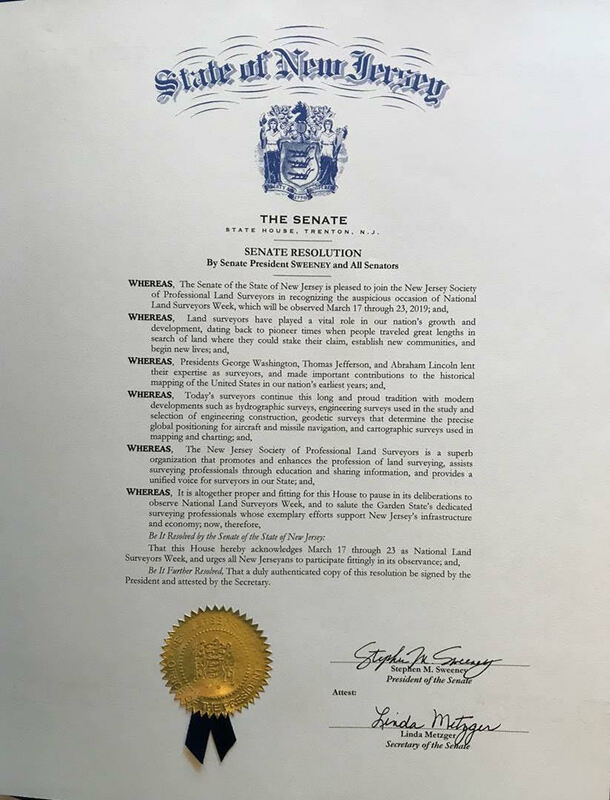 NJSPLS also received a proclamation from the New Jersey Senate. A special thank you to Keystone Precision represented by Keith Jones and Jason O’Rourke who gave demonstrations on instruments. 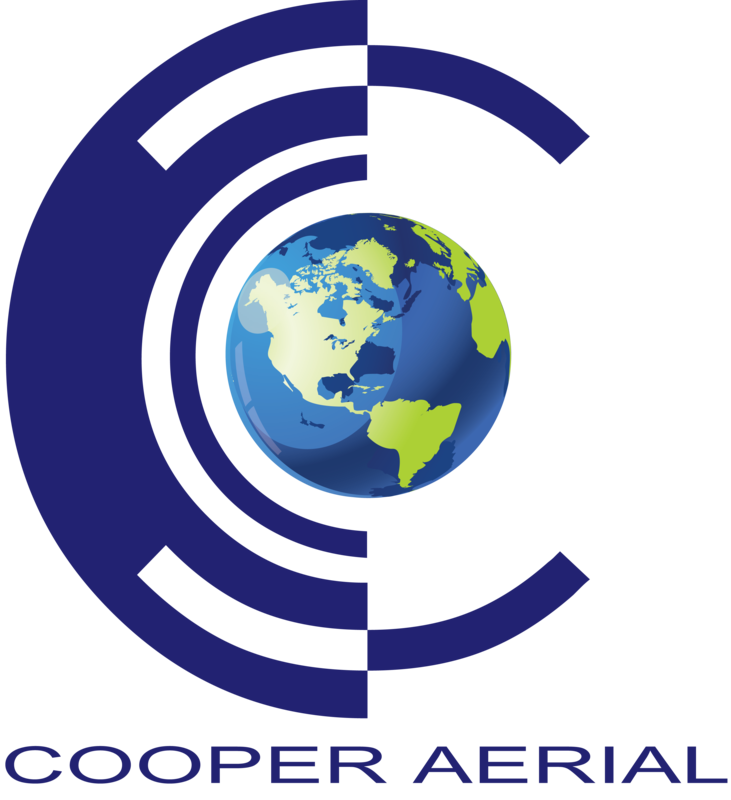 Pete Priestner of Cooper Aerial was on hand providing refreshments. National Surveyors week is a vehicle to raise awareness of the profession of surveying and the important role that it plays. Al Fralinger is the founder and Chairman of the Board of Fralinger Engineering PA. He has over 50 years experience in the civil engineering and land surveying fields. Mr. Fralinger has been instrumental in working with Rowan University’s Engineering Department, which has led to the development of a new four-year degree in Land Surveying. 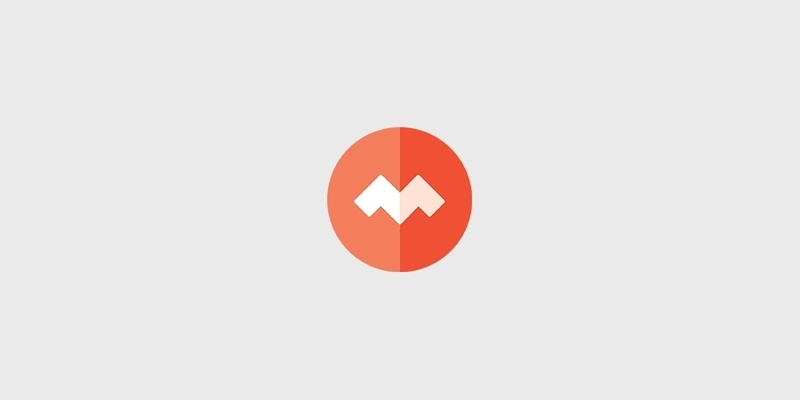 An official announcement will occur in the near future. 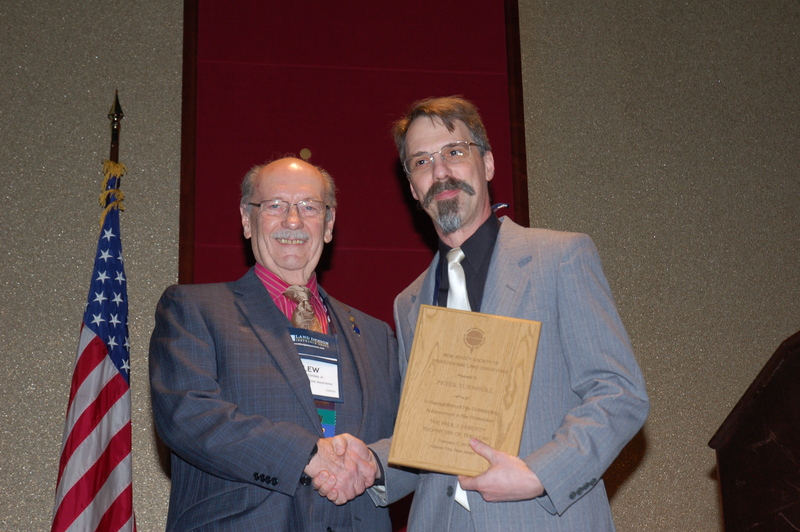 Presenting the award to Mr. Fralinger is Dr. Tony Loman, Dean of the School of Engineering at Rowan University. 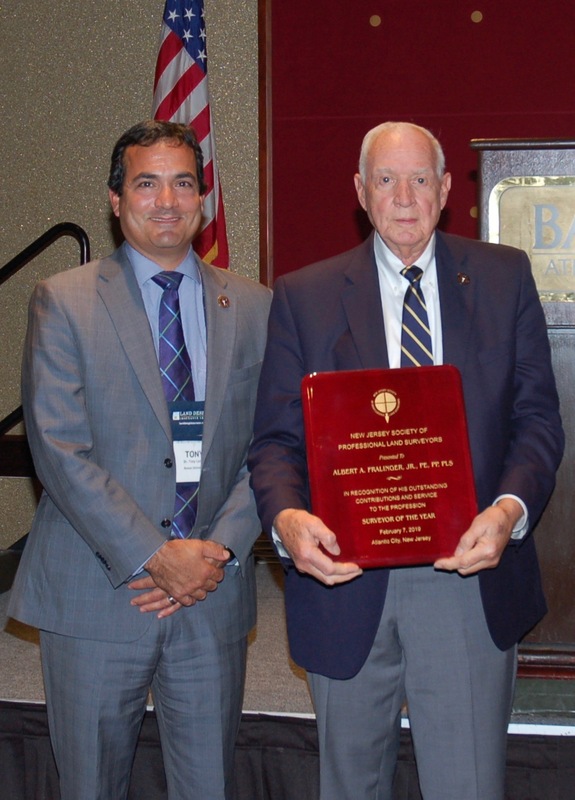 The William T. Murray Lifetime Achievement Award was presented to Albert N. Faraldi, PLS by Lew Conley Jr., PLS. 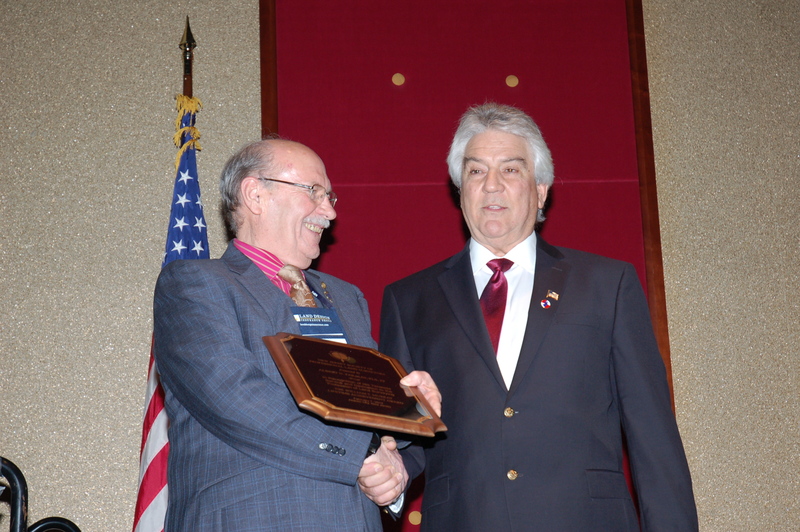 Al has dedicated his professional career to surveying and has been a prominent figure in NJSPLS for decades. 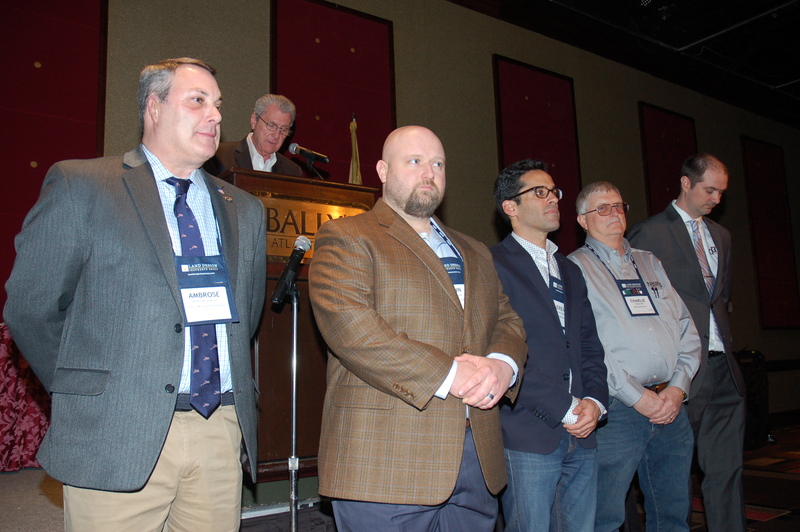 He has served as NJSPLS President, Conference Chair, as well as numerous other roles in the organization. He was appointed to the State Board of Professional Engineers and Land Surveyors in 1994, serving as its President from 1999-2000. John is employed at Charles Surmonte. He trains the surveying crews on the use of equipment and oversees all aspects of surveying work performed. He is active in the Central Jersey Chapter meetings and activities and is working toward licensure. Peter Turnbull currently works for the Township of Roxbury as the GIS Technician. He has worked on a variety of surveying projects over the years, from boundary to construction layout, and has a true passion for deed research. He is always trying to improve the Township Tax Maps by identifying errors and assisting the public by providing old maps from archives. 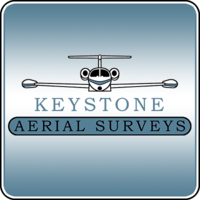 Surveyors in the North Jersey Chapter truly appreciate the help that Peter provides them. This year marked the 30th year NJSPLS has held our SurvCon Conference at Bally’s Atlantic City, a Caesar’s Entertainment property. Jim Marota has insured that we get the best possible experience every year. Jim has worked in Atlantic City for 25 years. He has spent a majority of his career working for Caesars Entertainment. In addition, for several years he worked for the Atlantic City Convention and Visitors Authority. On October 1, 2018 he was promoted to the Director of Sales for the Atlantic City Region for Caesars Entertainment. 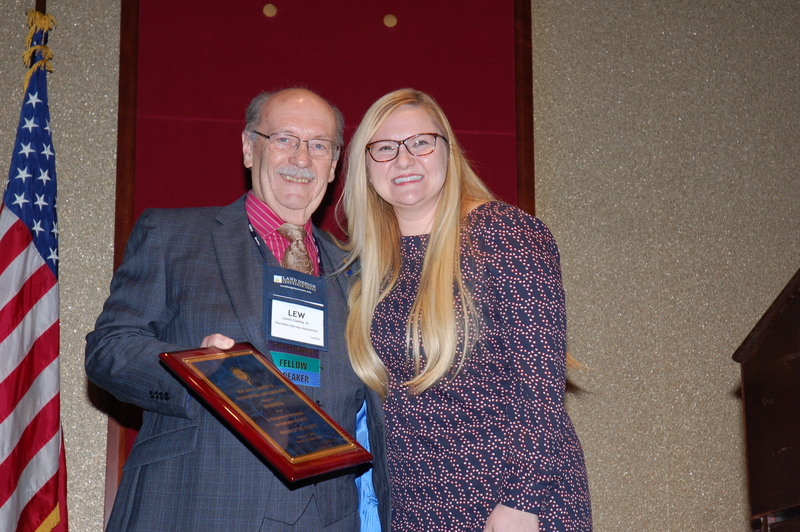 Allie Bashinski accepted the award on his behalf. Thank you to our survCon Exhibitors! 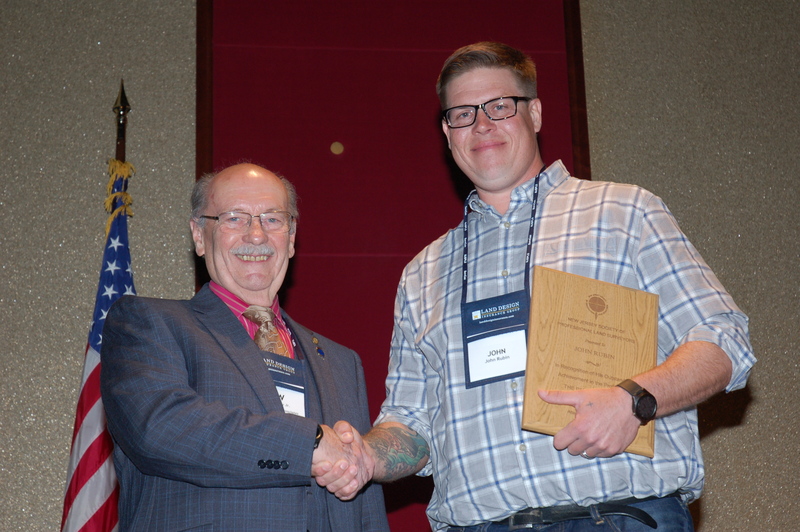 Carlson Software Nor East Mapping Inc.
Control Point Associates, Inc. Robinson Aerial Surveys, Inc.
David Ingram ~ Historical Equipment Seafloor Systems, Inc.
Keystone Precision Instruments Wetland Studies and Solutions, Inc. The workshop handouts for SurvCon are now online. Click here to view/download. This download will be removed from our site on March 1, 2019. The current version of the FEMA Elevation Certificate expires on November 30, 2018. However, we have received direction from FEMA that the current version should be used until further notice. FEMA is in the process of preparing an official bulletin conveying this information, but we wanted to update you as soon as possible. QUESTION: How CAN I Pay MY Dues Online? QUESTION: How Can I Access my PDH Credits? Catch up on the latest issue of Good Points, our weekly e-newsletter, or search for articles in past issues. Access Good Points here: Good Points. NJSPLS, a proud Affiliate Member of NSPS! Click on the NSPS image below to be taken to the full NSPS site.